The first try on this cake did not turn out well, as I interpreted the “pan cakes…serves 12” more literally, thinking an eight-inch square pan would make sense. 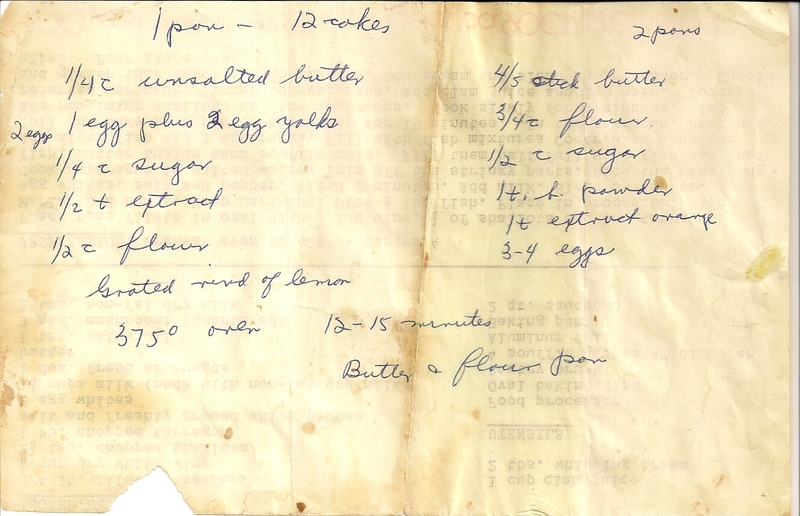 This initial effort involved a different technique from the recipe below, as I started with the creaming butter and sugar basis for many cakes. However, this did not help with creating volume or air in the heavy batter, so the first cake came out flat and dull. Initially, I was going to give up and write a post about this failed effort. Yet my sense that my grandmother would not have kept a recipe for a thin, flat lifeless “pan cake” made me want to try again. First, I decided on an eight-inch round pan (which has much smaller area, I calculated with the Pi time the radius-squared, or about 48 square inches in area versus the 64 of the square pan, assuming the same depth – high school geometry continues to serve me well!). Second, I chose to try the egg-sugar technique, creating more volume and the prized “ribbon” stage in the luxurious golden mixture. Third, this is a very quick cake to create with a stand mixer, and I had everything easily on hand and ready for a second go. 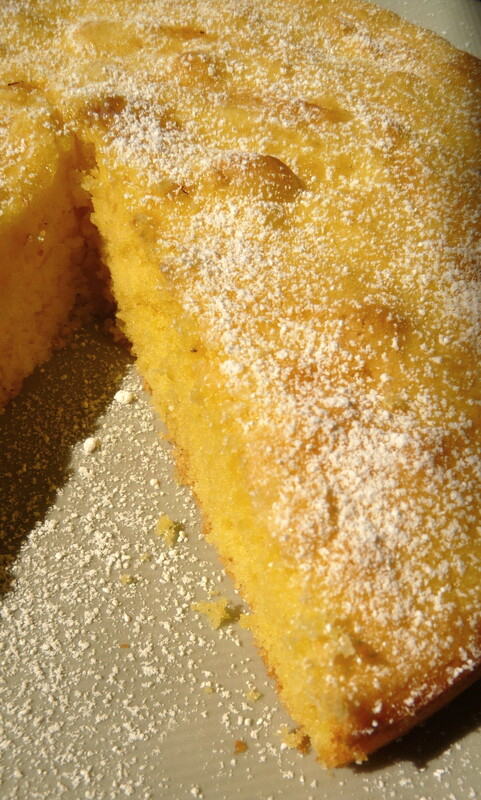 The second cake turned out very nicely: much lighter and more delicate in its crumb. Unlike the sponge cake in last week’s post, this one is more of a quick one-bowl cake, rather than a complicated and more time-consuming “show” cake. 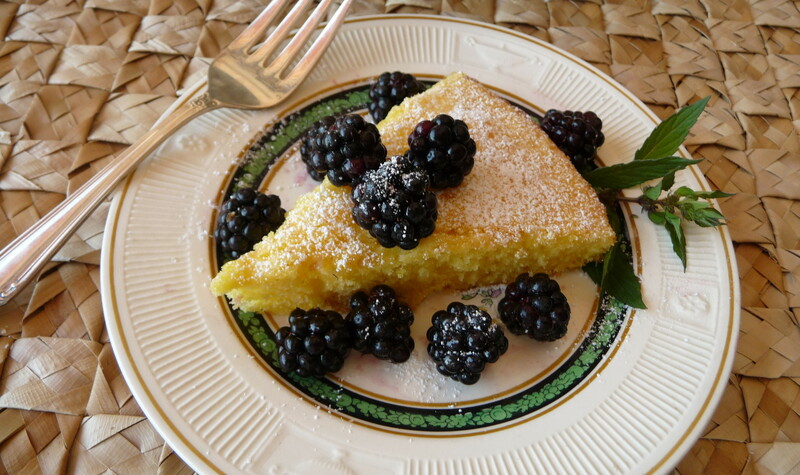 It is a subtle everyday cake, which I served with blackberries, freshly picked from the vines (as ubiquitous as they are on this island, the introduced Himalayan variety does yield wonderful blackberries). 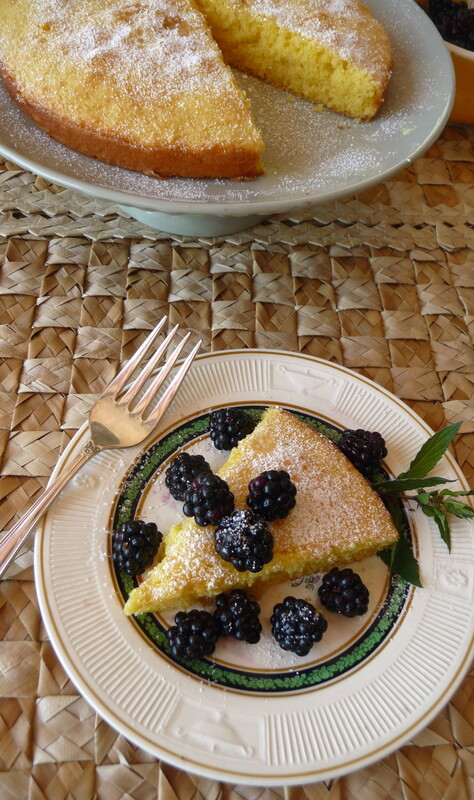 Jessie’s double recipe – though a bit confusing with the amounts not all precisely twice the single version – could be a good basis for a reliable citrus-infused layer cake, filled with custard or jam, and finished with frosting or whipped cream. I will have to try this in the future. Persistence does pay-off, as I am sure Jessie would have been the first to say such a thing, and the cake is a fine example of trying and trying again. Pre-heat oven to 375 degrees, positioning a rack on the lower-middle rung. Mix eggs and sugar in the bowl of a stand-mixer (preferably), using the paddle attachment for seven or eight minutes on level six (on my KitchenAid, that was the right setting). This can be done with an electric handmixer or, if you are really energetic, with a whisk, by hand. It will take much longer, I am sure. When the egg-sugar mixture become pale and double in volume (making a ribbon when the batter is dropped from a spoon back into the batter), add vanilla and citrus zest, on lowest setting. Or else, whisk them in. Still on lowest setting, alternate butter and flour in three additions, until just blended, being careful not to mix just until blended. Manually, this can be done with a spatula. Bake until golden brown for 11-12 minutes. Remove the cake from pan and cool completely on a cooling rack. 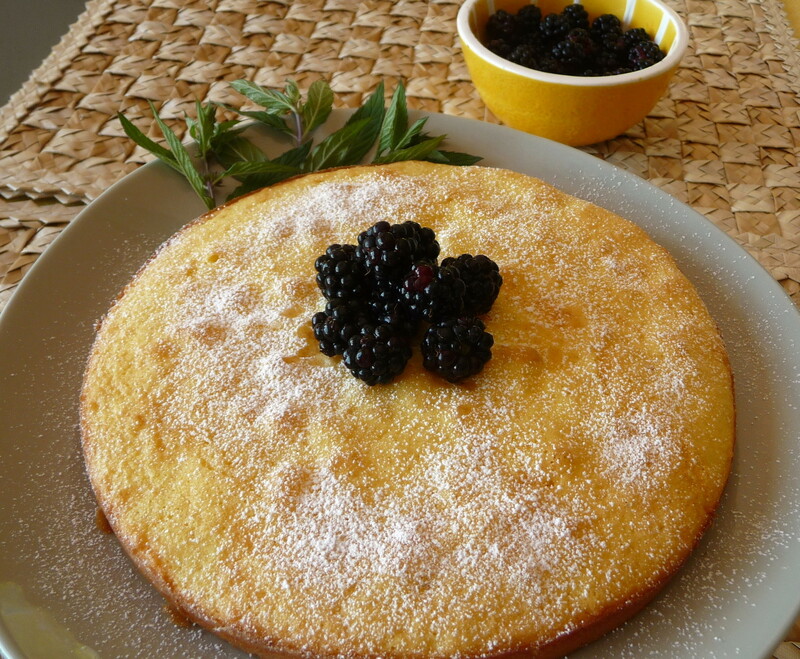 Serve with powdered sugar, blackberries, and whatever else goes with a citrusy Florida state of mind. 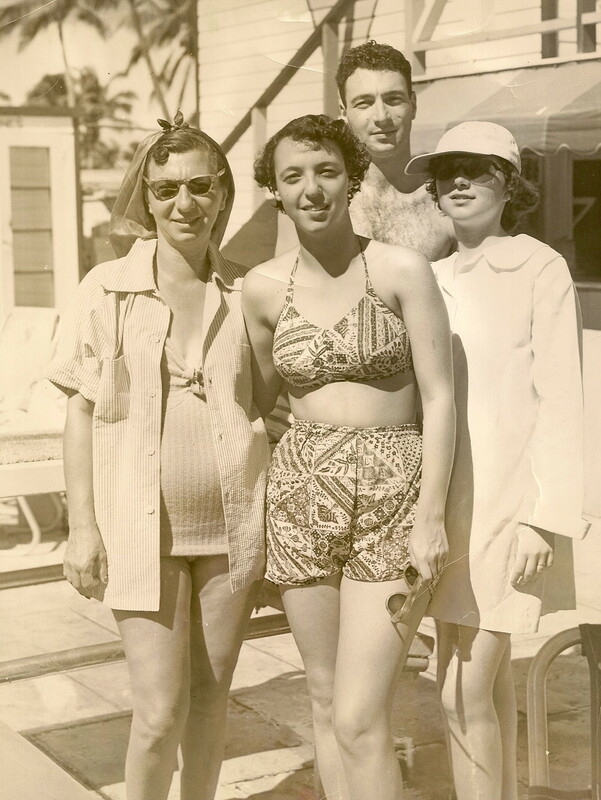 This entry was posted in Baking, Cakes, Dessert, Recipes Misc, What Would Jessie Dish and tagged Cake, Citrus, easy, fast, Old-Fashioned Cuisine, Vintage Recipes, WWJD. Bookmark the permalink. hi Dan, I have been reading your blog and am enjoying it so much I decided to subscribe! You also take beautiful photographs. I am going to try one of these recipes soon and will let you know how it goes. Good to see you back, Dan! Busy week? I’m glad you did give this another go because it looks beautiful – see? Always trust Jessie. She may not look like she’s making much sense, but there’s method to her madness. Thanks, Jax. 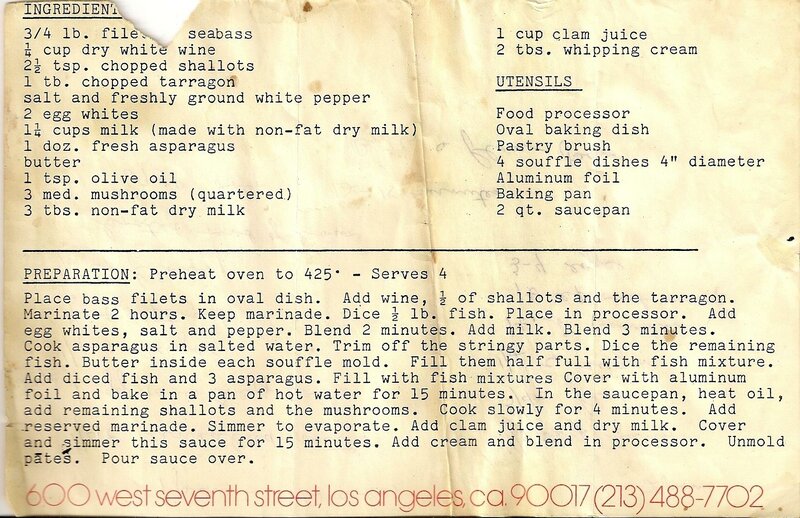 I agree about the fish terrine, as I can’t figure out how it could be good – chunks of fish and puree, clam juice, mushrooms, and whipping cream?!? At least I figured a way to make Jessie’s recipe turn out well. This is amazing pan cake…thanks for sharing! Looks like it would be perfect with a cup of coffee this morning. Glad you tried again, because version two looks beautifully fluffy and moist. How fun to be a detective through her recipe box. 600 W 7th St. in Los Angeles is the Robinson building, for many years (1915-1991) the flagship store of J.W. Robinson Co., a department store. It’s now parcelled out into various suites, but from the lack of a suite number in the address I’m fairly certain the paper is from the Robinson’s era.